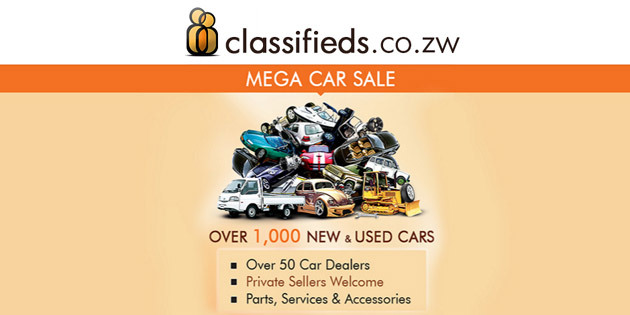 Yesterday, Webdev, the local internet company behind Zimbabwe’s largest classifieds property, sent out an announcement of an offline car sales event the company will host in November for its sellers and buyers. Called the Mega Car Sale, car dealers – the company says it has more than 50 of them listing cars on their website – will have the opportunity to sell in the good old fashioned way. Offline car buying is Webdev’s biggest competition so it makes sense why they’d want to do this. What’s interesting is why they are doing it now. Webdev has been a marketplace for cars for a long time. In fact, before classifieds became what it is today, Webdev has separate sites for the different verticals – properties, cars and electronic gadgets. We contacted the company’s Sales and Operations director, Vusi Ndebele, so we could understand more the motivation and strategy onwards with cars vertical. Techzim: What has motivated such an event? Vusi: Although we have nearly 4,000 cars for sale on classifieds.co.zw, buyers still need to experience a car in person – there’s no online substitute. They want to sit in it, smell the interior, wrap their hands around the steering wheel, pop the hood and rev the engine. Cheki Kenya held similar events earlier this year (https://www.facebook.com/chekicheki/videos/982314355132240/ ) and we hope to emulate their success in convincing the large community of ‘offline’ buyers and sellers that our large vehicle inventory is for real and they can interact through our online portals with confidence. We’ve been working for many years with 50+ auto dealers around Zimbabwe who advertise their inventory on Classifieds and felt this would be an ideal marketing channel for them. We anticipate that they will benefit greatly from the exposure. We selected an affordable venue so everyone could participate and the response so far from dealers and private sellers has been great. Vusi: We’ve spent the last few years focusing on property and now have over 95% of Estate Agents in Zimbabwe using our cloud Property Management System (www.propcloud.net) to run their back office, website and automatic upload to www.classifieds.co.zw and www.property.co.zw. The next major Classifieds category is Auto to which we will dedicate a great deal of energy in the coming year. We now have 10 dedicated sales agents to assist dealers to advertise online. Techzim: What’s changed since OAM? Thot cheki Zim would be active by now? Vusi: Quite a lot is happening behind the scenes with OAM, locally and regionally. We will release more information into the public domain soon. Cars vertical is still in the making. The software and content is in place but some branding and migration matters are yet to be finalized. So, nothing to share yet on what the company and OAM have become together. 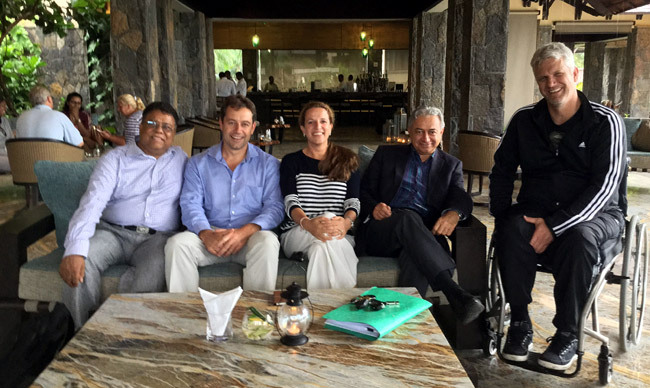 We did notice though that Garth Drummond, the founder and former CEO of Webdev, is now heading a One Africa Media operation in Mauritius. OAM shared blogged post about this and the picture below about two weeks ago. Second from left, Garth Drummond, and extreme right, Justin Clarke, the CEO of One Africa Media. Image credit: OAM. This is some very good creativite from the company and constantly keeping in touch with users needs. No surprise that Webdev stil remains the leader through innovation by sensing their market and adjust when necessary. Very creative for sure and responsive to clientele needs and market movements! Tell us where and when! Well done Webdev!! It’s a good plan, but charging both buyers (viewers?) and sellers sounds like double-dipping to me. only $1 for visitors. I understand the purpose of the fee it’s to control crowds more than it is about the revenue – makes sense in that part of town. Otherwise you’ll have the place overrun by people killing time who have no intention of purchasing a vehicle, pick-pockets etc. $1 is definitely about the revenue. There are plenty of ways to control crowds that don’t involve payment (online lottery, or limit to the first X hundred people). I’m fairly certain pick-pockets can afford the $1.